We’ve all got triggers — those situations, people, or moods that trigger us into reacting less than appropriately to an issue. Our amygdala (part of our brain) triggers emotions faster than out conscious awareness. It can rule our reactions without the benefit of logic or reason. This is one way to describe what low Emotional Intelligence (EI) is about. Fortunately, the way we react in these instances is not always due to lack of ability. More often, reactions are the result of our habitual responses. With EI skills we can, however, learn to respond more appropriately by paying attention to the time of day, the location, our mood, and our physiological state. If you can pinpoint the circumstances that cause you to act in ways that lead to bad results, you’ll essentially reduce the impact of the amygdala. One of the best ways to manage your instant reactions is to simply pause for a moment and bring more logic into the situation. I do acknowledge that in some situations a pause may seem unlikely, but it can take just a few minutes to handle things better than you have in the past. Becoming more in touch with your reactions means you can create an early warning system of triggers to help reduce your spontaneous reactions. I share here 4 ways for you to recognize your triggers and 4 strategies to help you become more emotionally smart in your responses. Body scan. Pay attention to how your body shows symptoms, such as sweaty palms, headaches, or tightness in your chest. Start recognizing these patterns as early warning signs that a situation is causing you stress. Then pause. The minute you feel these symptoms, pause and identify what it is about the situation that is causing your body to react. Emotion. Can you accurately name the emotion you are feeling? What is the difference between frustration, irritation, or anger? One way to increase your EI is to increase your emotional vocabulary. People with high EI can master their emotions because they understand them. Their use of an extensive vocabulary of feelings helps them make conscious decisions to redirect their emotions more effectively. Self-talk. One way to identify your triggers is by completing statements like, “I become irritated when…,” or “On my team, I wish people would…,” or “I think it’s impolite to…” When we allow negative self-talk to control our reactions, we often react in less than stellar ways. Switch to positive self-talk. Once you’re aware of your triggers, consider seeing the situation as an opportunity to set ground rules, improve the culture, or design better ways of working together. 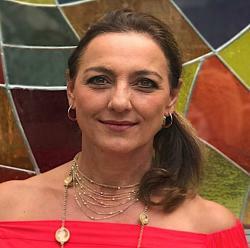 With a positive mindset you may then say things like, “When I become irritated I can view this as an opportunity to…,” or “On my team, I will share how I wish the team to behave…,” or “I think it’s more productive to…” Think about ways you can actively manage how you respond to these moments with self-talk. Don’t personalize. In conflict situations the other person’s behavior may feel personal, which is why it has the power to upset you. But what if it has nothing to do with you? What if you could de-personalize the way you view the conflict at that moment? Become a third party. Remove yourself from the situation. Imagine that you are watching the situation happen to someone else. What would be the best way for that person to respond? What questions would they ask? Imagine what you might say to a close friend struggling with the same issue. Adapting your behavior with this trick will help you manage emotions better and respond in a more balanced way. 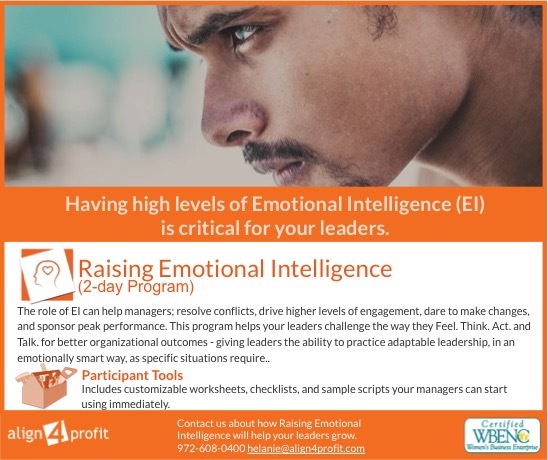 In our Raising Emotional Intelligence Programs we help your managers respond to “key moments” in ways that move them away from the survival instinct and practice strategies that move the situation towards successful responses. This and a host of other skills will raise EI within your organization. Your managers will be better equipped to clarify vision, act with integrity, embrace change, and drive higher levels of performance and engagement.